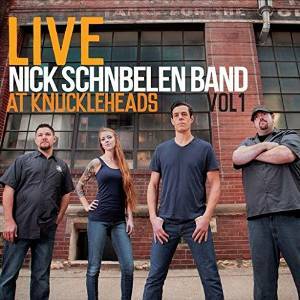 I just had the opportunity to review the newest release, Live at Knuckleheads Vol 1 from Nick Schnebelen Band and I really enjoyed it. Opening fleet fingered rocker, I'm Goin', this band is on fire. Nick Schnebelen, founding family member of Trampled Under Foot, has lead vocals and guitars and he's ripping. Joined by Heather Newman on guitar and vocal, Joe Voye on drums and Cliff Moore on bass, this is a great opener! Newman takes the lead on Willie James, with a little more of a country flare, the band is taking this crowd by storm. Schnebelen's riffs are hot and explosive. Cover of Gnarls Barkley's Crazy, featuring Newman on lead vocal maintains it's original pop format but with a snarling guitar solo backing Newman's solid vocals. Slow ballad, Desperate Heart, again features Newman on lead vocal and gives Schnebelen a terrific opening to really kick out the stops on his blues riffs. Clocking in at over 5 minutes and with a touch of old San Francisco, this track is a screamer! With a taste of Son House, Break Of Day, takes on a modern day blues rock format. Schnebelen is back on lead vocal and sticks it on his guitar riffs. Tight backing by Voye, Newman and Moore makes this one of my favorite tracks on the release. Bad Disposition is a modern rocker with blues roots. Elongated guitar riffs and a very strong bass and drum combo give this band some of the best characteristics of Cream. With Muddy Waters like slide work and a stomping pace, Tailgate Swing, featuring Newman on lead vocal has strong underpinning. Willie Dixon's Spoonful has nice interplay vocally between Schnebelen and Newman with super drumming, again putting me in mind of Cream. Very nice. Classic Santo and Johnny track, Sleep Walk, is covered very nicely by Schnebelen on slide. Resurrected by Jeff Beck a number of years ago, this track has become a modern classic and great that it has. Nicely done. Dolly's, Jolene, is up next and Newman covers it nicely with a country inflection in her voice. Schnebelen shows his skills at Knopler style riffs blending nicely with the modern country style. Wrapping the release is driving rocker, New Orleans, by 60's rocker, Eddie Hodges. This track is burning hi octane with Schnebelen on slide and vocal and the band leaving nothing but dust. Great closer to a highly energetic release.